Seedlings in nature are easy to find, and with seedlings, one can learn a lot about growing bonsai from the ground up. When older stock is used, tree trunks are more mature so time is saved from the process. However, in a few years a small seedling can make a nice, small bonsai. Since plants grow faster in the yard or field, it is advisable to grow your chosen seedling in the earth until the trunk is a suitable size for the bonsai you're planning. You can transplant it to a convenient spot for leaf/limb pruning and fertilizing. Make notes about the process with dates for future reference. If a seedling has good qualities- plenty of limbs and healthy - try it! It may not be exactly like the parent plant, but the tree will make an inexpensive lesson. A cutting propagation will yield a better duplicate if you desire a closer match to the tree or hybrid. Elm seedling found growing under the above Chinese Elm. One year old on photo date 3/28/03. Limbs have been trimmed by foraging rabbits. Small fences might be needed. Best time for transplanting is early spring and fall. At that time, trim longest roots. Prune apex down to re-proportion tree, and cut long limbs to globe shape of original parent tree or start pruning for another style you've chosen. Take care to cut between leaves on a branch - not too close to a leaf. 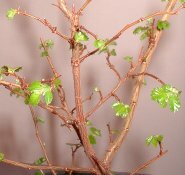 Tender new leaf shoots at the end of limbs can be pinched back to encourage fuller growth. All pruning on the perimeter helps with later choices in shaping the tree as it routes energy back toward the trunk increasing the size of trunk and the number and sizes of limbs. If you mix your soil with a good pine bark mulch, fertilizing may not be needed. Over-feeding can cause elongated limbs and large leaves. In this case, clip back and/or pinch off large leaves. For comparison, this elm in a pot is a year older than the elm above. This illustrates the difference in trunk size using the two methods. The method of training in a pot works fine if you're planning a Komono or Mame bonsai. See "Starting Up" for sizes and styles. Same Chinese Elm parent tree as above seedling. Potted up in May 2001. 5/30/02 photo. Trunk growth is slow though pot is ample and we fertilize. Good mulch was added with a little sand to help with aeration in pot. 2/23/03 (nine months later) The potted Chinese Elm growing in a screened porch leafed out early due to the protective climate of the porch. 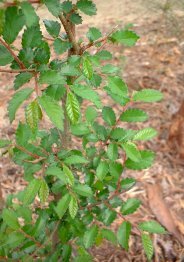 In North Georgia, Chinese elm is deciduous. It may keep it's leaves in a Florida or Southern California climate. Branching has matured and we continue to fertilize and prune in the growing season. Repot every two years or when root-bound or when ready for a shallow training pot. Plastic bonsai training pots can be used to help with visualization and since they are shallow, you will begin the phase of pruning out larger tap roots to encourage small fibrous root density creating a balance above and below ground. Soon you will have a miniature tree that can be transferred into a finished bonsai pot. 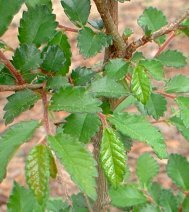 Chinese Elm is a fast growing tree with naturally small leaves and exfoliating bark. Readily, three reasons why this tree is a good, interesting choice for growing as bonsai. Elms are also hardy and grow best in full sun with good soil drainage. The Chinese Elm produced today is resistant to disease which has been a problem for the American Elm. Chinese Elms go well in these styles: formal upright, informal upright, slanted, and broom.